Before I knew about Eva Ibbotson, before I discovered Georgette Heyer or had ever heard of D.E. Stevenson, there was one author whose books I knew I could always turn to when I needed an easy, absorbing read: R.F. Delderfield. Poor old Delderfield has gone rather out of fashion these days, though he was quite popular from the 1950s to the 1970s, but it is hard to think of any writer who can best his absorbing family sagas. 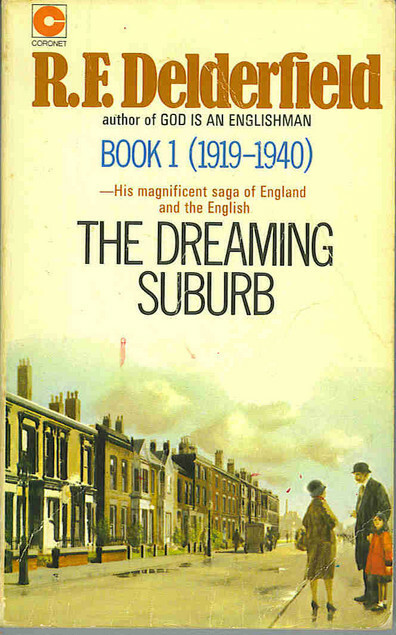 I wasn’t quite up for a reread of his “God is an Englishman” or “A Horseman Riding By” series – both of which are excellent – but I did pick up The Dreaming Suburb earlier this year. Spanning over twenty years – from the summer of 1919 to the summer of 1940 – The Dreaming Suburb follows the lives of the residents of an avenue in a modest London suburb, focusing on several families. There are the Clegg sisters, stalwart Edith and dotty Becky, who take in lodgers over the years to make ends meet. There are the unhappy Firths, ruled over by the strict and sour Mrs. Firth until one by one they begin to break away. There is the lovely young widow Mrs. Fraser and her romantic son Esme, who uses the fields behind the Avenue to play out his childhood fantasies of knights and daring rescues. And there are the Carvers: solid Jim Carver and his seven wildly different children, including the sharp, business-minded Archie, the co-dependent and always resourceful twins, Berni and Boxer, and the dependable Judy, whose childhood adoration of her neighbour Esme Fraser matures into unrequited love. From the Spanish flu to the Battle of Britain, from silent pictures to talkies, from the General Strike to Mosley’s Blackshirts, Delderfield chronicles some of the most eventful years of the century on very human terms. He shows what these societal changes meant for ordinary people. This is not a saga involving manor houses and leisured lives; almost everyone here, male and female, works and works hard. The people are often foolish and petty, they make mistakes that cannot be easily undone, but they also find happiness. This is Delderfield’s tribute to the ordinary man/woman and as such it is excellent. The companion to The Dreaming Suburb is The Avenue at War, which focuses on a much shorter period that the first book. I don’t love it quite as much as I do this but after reading the one you really have to read the other, just to know how everything ends. Taken together, they are immensely satisfying. Delderfield is not a “great” writer but he certainly writes great, readable books. My parents had God Is An Englishman on their shelves when I was growing up, and I read it but didn’t really appreciate it. I hadn’t developed a taste for family sagas yet! I don’t think I’ve ever looked for his other books either, but this one sounds like it would be fun. If you like family sagas now then he is definitely an author you’ll have to try again! on March 5, 2014 at 23:51 | Reply Wordy. R.F.D. Is a consumate story teller. I am so pleased you have highlighted him as he deserves to be read by a new generation. 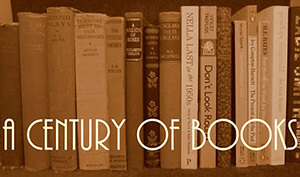 His ‘Avenue’ trilogy is as good a social history of Britain between the WWs to be found and an excellent read to boot . To my mind it is a precursor to William Boyd’s ‘Any Human Heart’ and just as good. He really does deserve to be read more widely. I know his books were reprinted in recent years and are now also available as e-books, so at least the publishers haven’t completely forgotten him. I too remember Delderfield being around a lot in my childhood. This goes to prove what I often feel, that books which aren’t necessarily classed as great literature tell us more about how people really lived and felt – a kind of social history, really. That’s so true. This is the most social history-esque of Delderfield’s books but part of the reason I adore one of my other favourite authors, Angela Thirkell, is because of how well her books reflect her era and society. I remember seeing a lot of R F Deldrfield books around years ago. This sounds lovely just the kind of thing I like. I think you would really enjoy his books! Will look for this new to me author! Thanks. Glad you enjoyed the review and I hope you get to read more of Delderfield’s books in the future! I read some of his books back in the 70s, but it seems to me I could never get deeply engaged with the characters, despite the attractive titles and cover art and my favourite time periods. I’m happy to give The Dreaming Suburb a try, though, if it’s available at the library. Hey, what’s one more book on the towering TBR stacks? Got it. One copy available at TPL, and 1 reserve ahead of me. I’ll bet it’s another of your blog-followers. They’re certainly not three-dimensional characters so, fair warning, don’t go looking for that in any of his books! But they are still great stories. Oh what memories you bring back. I haven’t read Delderfield myself, but he was my mother’s favourite author. In particular she loved ‘A Horseman Riding By’. I’m pretty much the age now that she would have been when I remember her reading them. I shall really have to see what I can find. I’m named after Claire Derwent from “A Horseman Riding By” so, not surprisingly, that series was my parents’ favourite, too! His books are what were called in my family “ripping good yarns.” Wonderful sagas, and what a storyteller he was! I have both The Suburb and The Avenue on a shelf somewhere & you’ve inspired me to re-read them both. I tried re-reading God is an Englishman last year, but I didn’t get on with it at all. This appeals much more to another who found Delderfield on her parents’ bookshelves. I think you’d like this a lot more, Jane. I hope you’re able to track it down.